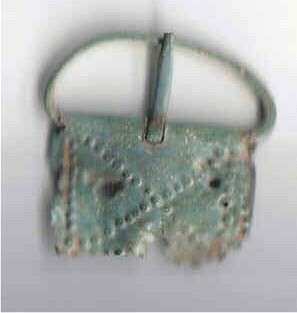 The number of these found in Britain is few and the evidence for their origins is meagre, and in the case of the ‘Quoit Brooch Style’ controversial. However, there are a few things that can be said about them. 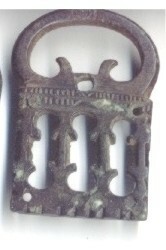 These feature the same style of openwork plate as found on the dolphin open loop group. However, in this case, they are fixed to a plain loop (1, 2, 3). 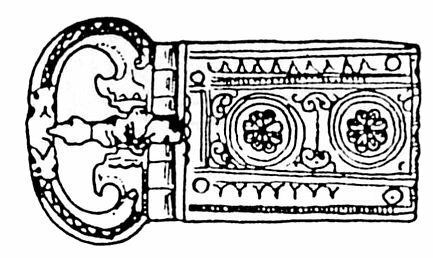 Stylistically this group is very close to continental examples (4, 5) and it seems likely that those found in Britain are either imports, or at least, represent strong continental influence. 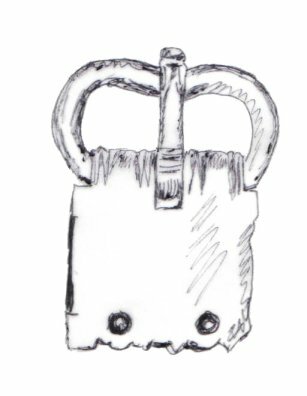 From the few examples available, distribution seems to be mainly in south and south west England, which could make them another example of the strong continental influence on this area’s buckles that is examined in more detail in the Triangular Plate Buckles section. 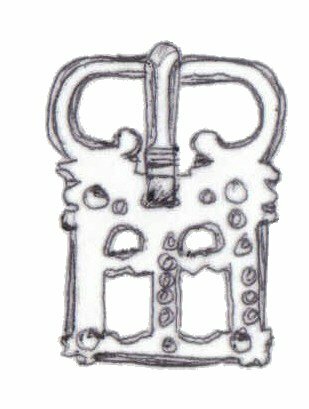 The controversies surrounding the so-called ‘Quoit Brooch Style’ are outside the remit of this study. 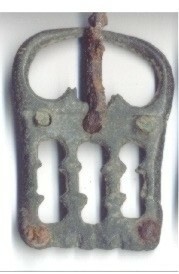 Suffice it to say that there is a very rare category of buckle has been linked to this style (6, 7, 8). 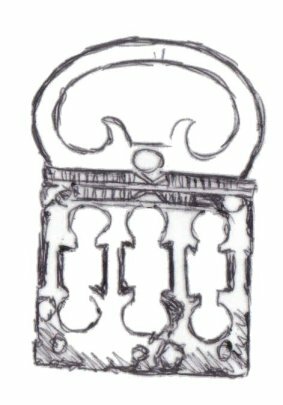 The form of their loops and their fixed plate arrangement, appear to have something in common with the group just discussed above, but instead of openwork plates, they have highly decorated plates. 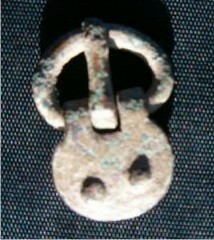 Some see this as ‘Quoit Brooch Style’ a fusion of late Roman and Germanic style that flourished in south-east England in the early Anglo-Saxon period. 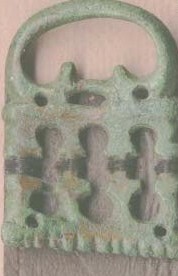 It is worth noting, however, that the decoration on these buckle plates also has a fair amount in common with that on some of the long thin buckle plates associated with horsehead and dolphin D Ring buckles (9, 10, 11). These types occur in profusion along the imperial border on the continent. In Britain, however, they are really quite rare, which must say something about the relative military isolation of Britain towards the end of the 4th century. 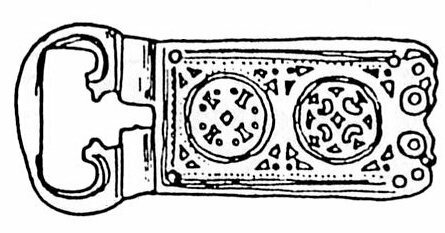 There is no difference between the types found on the continent and those few found in Britain, so it is reasonable to assume that the buckles found in Britain are either imports or show strong continental influence. 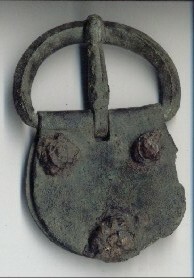 As such, it is no surprise to find that such finds as there are, are concentrated in the south. It is interesting to note that, though, that the south-east, with its concentration of military units along the Saxon shore does not dominate. About equal numbers are found in the south-west. 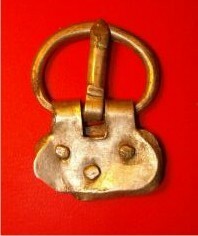 Since these buckles are very largely a continental phenomenon, we shall not deal with them in detail here. Plain rounded loops appear with both rounded plates (12, 13) and square plates (14). 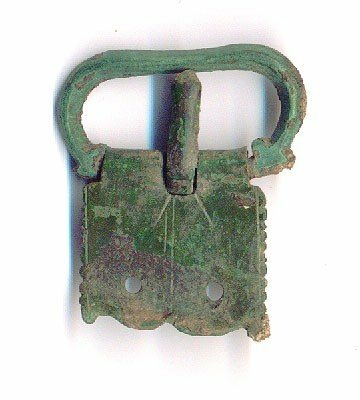 A small number of these buckles has been found in silver (15), an unusual feature for late Roman buckles. Usually the loops are quite chunky but there is a less common variant with a very thin loop (16). Variants also occur with kidney shaped loops (17) instead of the rounded variant. And there are a small number with square loops. 8.1 Width 30mm, found near Chichester, W. Sussex, collection of Stuart Laycock; 8.2 Width 35mm, found SW of Barbury Castle, Wilts., collection of Brian Cavill; 8.3 Width 35mm, found southern Britain, redrawn after Mills (RB195); 8.4 Width 35mm, found Austria, collection of Brian Cavill; 8.5 Width 29mm, found Trier, Germany, redrawn after Sommer; 8.6 found Ospringe, Kent, redrawn after Evison; 8.7 Redrawn after Evison; 8.8 Redrawn after Evison; 8.9 Length not known, found Catterick, Yorks., redrawn after Hawkes (2); 8.10 Length 77mm, found Cirencester, Gloucs., redrawn after Hawkes & Dunning; 8.11 Length 78mm, found Duston, Northants, redrawn after Hawkes & Dunning; 8.12 Width 40mm, found Norfolk, collection of Brian Cavill; 8.13 Width 18mm, found Bassingbourn, Cambs., collection of Stuart Laycock; 8.14 Width not known, found Hampshire, private collection; 8.15 Width approx. 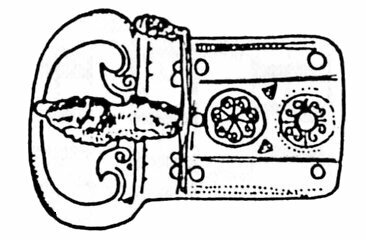 33mm, found Cambridgeshire, collection of Stuart Laycock; 8.16 Width 40mm, found Richborough, Kent, collection of Stuart Laycock; 8.17 Width 33m, found southern Britain, redrawn after Mills (RB201).